Yesterday, Isabel Marant hosted a party celebrating the collaboration in her native Paris, and the collection certainly does not diasappoint. In the lookbook, Alek Wek, Lou Doillon, Milla Jovovich and Constance Jablonski model pieces that echo Marant's Parisian bohemian aesthetic perfectly. 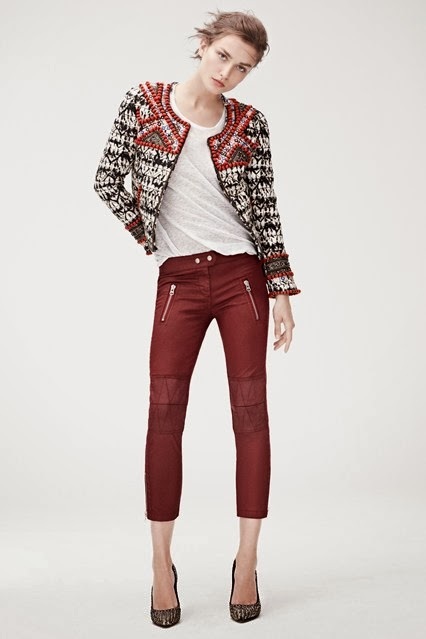 An embellished trophy jacket is worn with leather cropped trousers; a loose peasant top with printed jeans; and mannish outerwear with white trousers and slouchy boots with fringed detailing. Below are some of my favorite pieces. Start making your wishlist now, before the collection lands in stores on November 14.